I wanted to pass along some encouraging news about the future of Virginia's economy and our longstanding partnerships with the United States military. 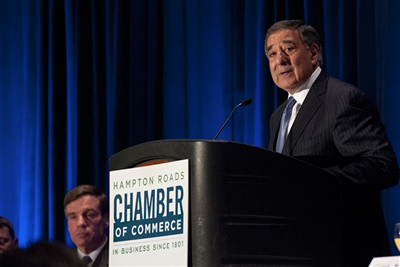 U.S. Secretary of Defense Leon Panetta visited Virginia last week to speak with more than 500 business and community leaders at an event hosted by the Hampton Roads Chamber of Commerce. As The Virginian Pilot reported, the Pentagon chief explicitly stated that our shipyards and defense contractors will continue to be key players in our nation's defense efforts. Acknowledging that the Pentagon must adjust and adapt now that we're winding down two wars conducted over the past decade, Panetta said "we will continue to invest in the unique capabilities and military and industrial facilities like those in Hampton Roads. The facilities help us protect the strongest military in the world." I urge you to read the full text of the Secretary's remarks here. Panetta – a former congressman, federal budget director, White House chief of staff, and CIA director – expressed understandable frustration at the threat of automatic, across-the-board budget cuts – the so-called sequester - that those of us in Congress enacted and must work to prevent before the end of the year. As a Virginian, I appreciated Secretary Panetta's acknowledgement of our Commonwealth's strong support over many years for our military men and women. "Simply put, [Virginia] houses perhaps the greatest concentration of military might in the world. And the support offered by [Virginia] to its service members, its veterans, to their families, is an incredibly important part of what makes this area the strategic national asset that it is," the Secretary said. "Whatever I do in my job, whatever we do on national debt, if we don't have elected leaders who are willing to come together and solve the problems facing this country, our national security is in jeopardy," the Secretary said. I could not agree more, and that is why I will continue my bipartisan efforts to craft a responsible, balanced plan to reduce our debt by cutting spending, generating appropriate revenues, and reforming our entitlement programs so they are sustainable.